This duet was kindly contributed by one of our followers, Larinda from Lennox, South Dakota. This city boasts the oldest municipal band in South Dakota, performing continuously since 1882. One of the most popular summer pastimes for Lennox residents is the weekly Thursday night band concert in the park. Besides band selections, these concerts feature special music from various local talent. The big concert of the year is always the one leading up to the “Old-Fashioned Fourth of July” fireworks display. Recently, while searching for a patriotic flute duet to be performed during the July 4th concert, I discovered a solo version of “American Patrol” on flutetunes.com. 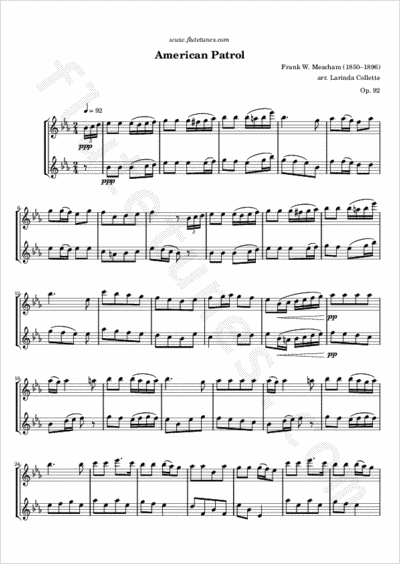 Since I was looking for a duet, I decided to write a 2nd flute part and arrange the piece myself. What I like most about this arrangement, is that the 2nd flute plays the melody at times and both flutes get a little solo action near the end of the piece. It starts out very quietly, mimicking the way a marching band would sound as it approaches, passes by and then fades off into the distance. This is such a fun song, incorporating “Dixie” and “Yankee Doodle”, and has always been one of my favorites! Thank you for your contribution, Larinda!